I am a chemist and an author who lives in the cold wintry regions of New York. I dabble in many a subject when writing. Actually I dabble in life. I’ve tried archery with a long bow. Medieval reenactment with the SCA. Creating cosplay for Anime North. Watching anime. Reading manga. Writing fanfiction (I do not plan to post that here). Grew up in a comic book shop. Attending many a local, and not so local, convention on science fiction, anime, comics, or fantasy. I do lots of things. I write lots of things. I hope you enjoy many of these things. 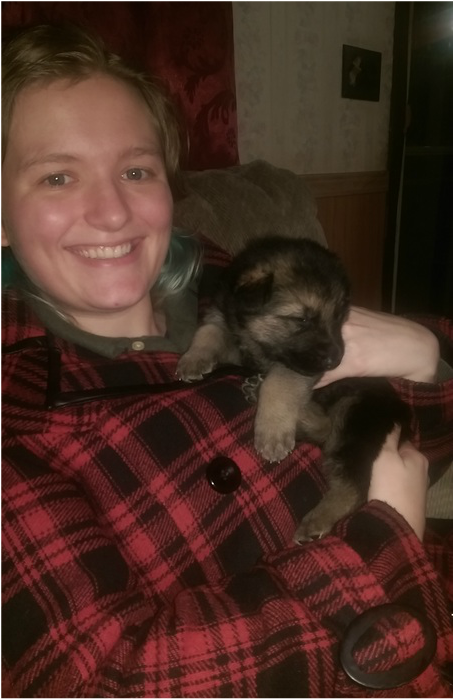 Shannon picking up her puppy before he weighed 100 pounds.